I learned this, at least, by my experiment; that if one advances confidently in the direction of his dreams, and endeavors to live the life which he has imagined, he will meet with a success unexpected in common hours. He will put some things behind, will pass an invisible boundary; new, universal, and more liberal laws will begin to establish themselves around and within him; or the old laws be expanded, and interpreted in his favor in a more liberal sense, and he will live with the license of a higher order of beings. In proportion as he simplifies his life, the laws of the universe will appear less complex, and solitude will not be solitude, nor poverty poverty, nor weakness weakness. 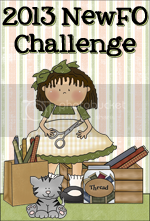 Barbara over at Catpatches is having a link up of the 2013 NewFo Challenge. Since I am apparently not able to actually finish hardly anything I may as well plod along creating more projects to clutter up my studio. It's a good excuse as any to cut up perfectly good fabric into small pieces. My plans to finish two projects this month went out the window when I began having knee problems which has made the trip down the stairs to my studio become a very real possibility of a fall. Since I would rather not have things go from bad to worse I have been confined upstairs with no sewing machine or projects in hand. When I send my husband down to fetch items for me I have to remember exactly where they are and all the needed elements. I will be working on a solution to this and hopefully not hearing bad news from an MRI next week. I am a notions junkie. When I had my shop (and even before) I had to try new rulers, tools and notions to keep up with the industry and offer new ideas for quilting. Since I don't need to buy any more fabric (since I have such a large stash) when I do stray into quilt shops or shows I still by the new tools that come on the market. I actually made a list several months ago of the expensive templates and tools that I have bought and have not used. Tell me I'm not the only one to do this. I thought it might be a good goal to try and actually use some of these expensive objects in 2013. I actually began with the latest one I purchased last month when I cut out the Christmas tumblers quilt. This month at the charity quilting meeting I used the Accu-quilt Studio cutter to cut out another tumbler quilt. I will be able to compare the ease of construction with these to sets of blocks. Again I would prefer to be able to play at the design wall with them but I think that the charity quilt could be figured out on EQ7 because it has a limited number of fabrics. Maybe I can get a sewing machine upstairs after Christmas and get something done! So here's to Castles Quilts in the Air for next year! Now to put foundations under them! Do you think I should do some tutorials on them as I use them? Let me know if you would be interested in seeing some and which ones in particular you are interested in. Maybe you can give me some motivation. I hope your MRI goes well and you're feeling better soon. And good luck with getting some of your sewing necessities upstairs where you can work again! Best wishes! I look forward to seeing what you do with each of these templates since I don't own most of them! Hope you are feeling better soon and that you are reunited with your sewing equipment before too long. Hope you feel better soon. I can't wait to see how you use all of these rulers. I too am a notions junkie and I love trying new things I have some of these and haven't used them yet. Heck I even have some from 20+ years ago that I have never used. Are You Ready to Hang Out?